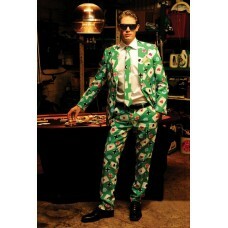 Poker ace mens suit & tie. We suspect wearing Poker Face whilst playing poker in the casino will make it pretty hard for your opponents to keep their poker face straight. This suit has Vegas written all over it and this poker costume will make a fantastic look behind a poker table putting you ahead of your opponents straight away. This casino suit, which comes with the tie, works perfectly during any Hollywood, James Bond, showbiz or mafia-themed party. Whether you are after a successful night out regardless of the occasion! Jacket, trousers, tie. Slim fit design. Machine washable fabric. 100% polyester. Sizes: Chest 38", 40", 42", 44", 46", 48", 50"..